Energy and apps are driving strong economic recoveries in parts of the United States. But the rest of the country has been far less lucky. The typical household in the San Francisco metro area earned nearly $80,000 in 2013, up 5 percent from a year earlier, the Census Bureau said Thursday. That makes the Bay Area one of the richest parts of the country and one of the fastest growing in terms of income. The single richest metro area: San Jose, traditionally the heart of Silicon Valley, boasted a median household income above $90,000. The drilling boom is giving tech a run for its money as an economic engine. The West Texas oil hub of Midland saw the biggest income gains of any U.S. metropolitan area in 2013. Its median household income rose 15 percent, after adjusting for inflation, to $71,000. In just two years, Midland’s median income has grown by more than a quarter. Its population is up 11 percent over the same period. But in much of the rest of the country, incomes were more or less flat in 2013: Of the 25 largest metro areas, only four — San Francisco, St. Louis, Detroit and New York — had statistically significant income gains. Only one, Charlotte, North Carolina, experienced a statistically significant decline. The rest were more or less treading water, as they have been for each of the past three years. Of the roughly 100 metro areas with populations of at least 500,000, just 10 have seen their inflation-adjusted median incomes rise since the recession ended in 2009. 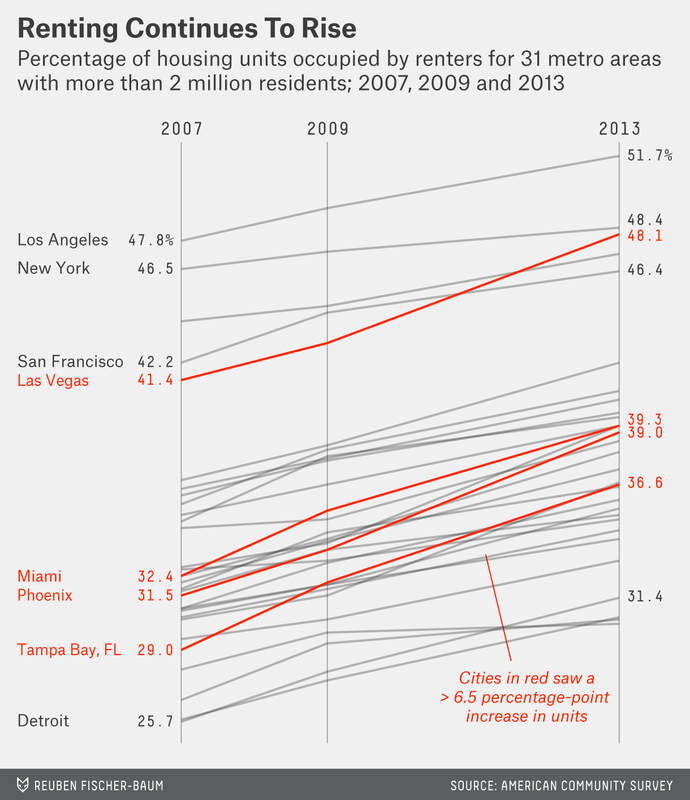 In terms of income, most American cities have yet to see much of an economic recovery. Even fewer have emerged from the hole dug by the recession. What is particularly troubling is how weak the recovery has been in many of the places hardest hit by the recession. In past business cycles, the worst-hit places also tended to have the strongest rebounds. But that hasn’t been the case this time around. The Cape Coral-Fort Myers, Florida, area, which sustained the biggest income decline of any big metro area during the recession, saw its median income fall even further in 2013. Overall, there is almost no correlation (R < 0.1) between an area’s income loss during the recession and its gains or losses since then. Income isn’t the only measure by which the recovery has lagged. Household net worth, the value of a family’s assets minus its debts, has fallen during the recovery as well. One big reason for that is the weakness in the housing market, as Thursday’s data made clear. It’s no surprise that home values in most of the country remain far below their 2007 levels — after all, the unsustainable real estate bubble was part of what caused the recession in the first place. 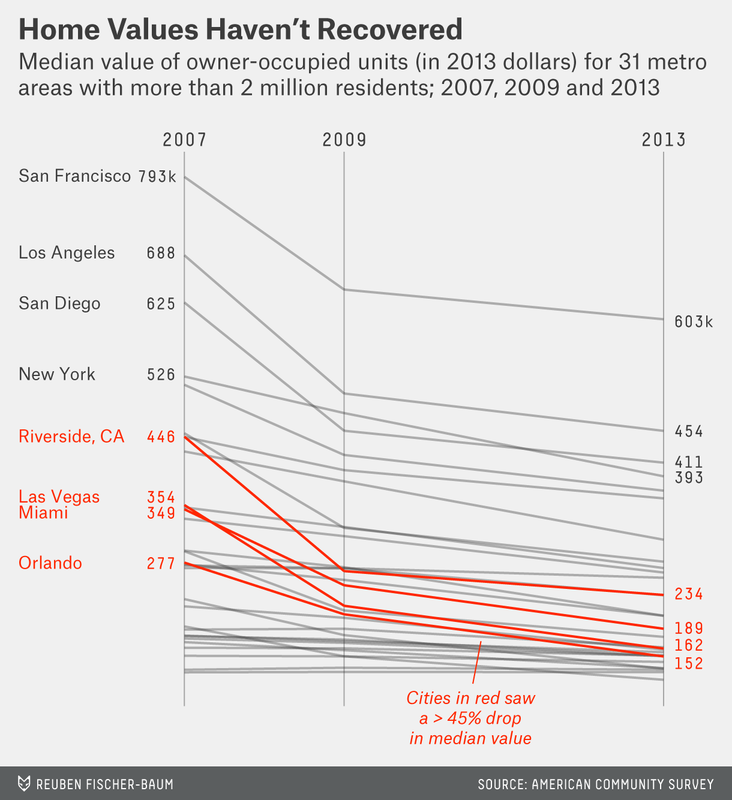 But in most of the country, home values are also lower than they were in 2011, long after the bubble had burst. The housing collapse — and the weak economy more broadly — has reshaped communities across the country, replacing owners with renters and leaving many homes unoccupied. The national vacancy rate (how many homes are sitting empty) was 12.4 percent in 2013, down from its peak of 13.1 percent but still well above its prerecession level of 11.6 percent. And the home ownership rate continued to fall: Just 63.5 percent of U.S. homes were owner-occupied in 2013, down from 67.3 percent before the recession. In some communities, the impact has been particularly severe. In Phoenix, for example, the home ownership rate (as measured the share of homes that are owner occupied) has fallen 7.5 percentage points since 2007. Other changes are far more gradual, but just as significant. The U.S. continues to grow gradually more diverse and more educated: 62.4 percent of Americans identified as non-Hispanic whites in 2013, down from 65.8 percent in 2007; 13.1 percent of American residents were born overseas, up from 12.6 percent; and 29.6 percent had bachelor’s degrees, up from 27.5 percent.